It is important to make sure your brakes are working correctly at all times. 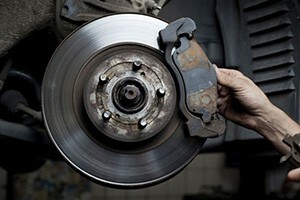 There are a few things to look out for when using your brakes to tell if they need replacing. Our Croydon and Surrey based garages can help determine all issues with your braking system. Grinding noises usually is a sign of the brake pads being worn and need replacing along with damaged brake discs. Pulling to one side is a sign that a hydraulic component or mechanical component is seized or sticking. A pulsating feel is normally associated with a distorted brake disc or drum. For your own and others safety, it's vital to have your vehicle checked over as soon as possible when you come across any of the above problems. If you think that you may have an issue with your brakes, call one of our garages today using the numbers at the top of this page, or you can drop by to one of our garages and we will diagnose the problem for you there and then, and can give you a quote while you wait. Prices exclude sport, high performance, modified, utility, 4x4, and commercial vehicles. Also excluded are brake discs that include wheel bearings, disc & drum combinations, wear sensors or electronic hand brakes. Price includes Parts, Labour and VAT. Brake service can be booked online - to book online, please click the button below. Or for further details contact your local branch.